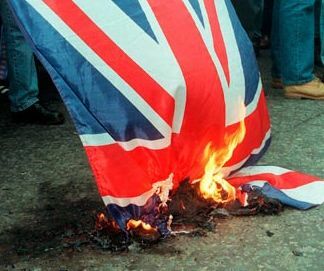 The United Kingdom Is No More. The picture above reminds me of my childhood days in the heart of the Black Country. Post war dereliction and bomb sites, with their smelly, decaying, concrete bunkers, were our playgrounds. One thing stands out more than any other. We weren't mollycoddled, spoilt or imprisoned in an electronic world. One where our imaginations are now the patents belonging to the electronic, soulless age that is today. Indeed, not withstanding the hardships, the stress of sheer survival and the damage wrought on kids' psyches, most of my generation strived to rise above the worst of deprived existences and many did. Towns and cities were rebuilt at great expense and hardship and the desolation was addressed with heart and soul. I suspect we carry all kinds of baggage from those tough times. However, then that was seen as part of life and the human condition. You just got on with it and did your best. Education was a very important part of this building of character and the teaching of unselfish necessity that allowed millions to live honourably and seek to do well by others. If one followed these apolitical and Christian tenets it more often than not guaranteed a useful, productive and happier life than otherwise. Then the global, post war New World Order began to take hold in the late fifties and sixties. Consumerism was taken on board as the way to corporate and political power and control. Television was subsumed into the central cliques of those who needed control over us all, in order to further their own wealth and superiority. Socialism in its present, corrupted form, was meant to protect us from the rich power mongers and seekers of our shillings, regardless of our desire or not for a bright new shiny set of toys. Suddenly our freedoms, so hard fought for in two world wars, were currency to be bartered away in the greedy dash for cash. A race to the bottom of the swamp was not held back by decency or fairness but led by the very corps of a movement that is no more considerate of fairness than a starving beast chasing us down for its next feast. This weeks elections prove how far we have sunk. A Party claims great success on a meagre vote and ignores totally the message the absent voters are conveying. That is "a plague on all your houses". Which is in effect, welcomed by the political, corporate elite since it makes the postal vote fiddling, the nail biting rigging of mysteriously missing boxes and the sheer nastiness of our multi-cultural Country. If ever there was one utter failure of the modern world, it is the mass migration of many millions of people. Tribes wiped out, poverty the receptacle of and misery based, enforced migration. The enforcement is not obvious since it is economic motivation that has lured so many down the Pied Piper road. Yet the result is one of such terrible consequences. The endemic populations of the West and The UK in particular are now unwelcome in their own towns and cities. The millions of deprived and poor masses of migrants are rootless and aimless. Their only hope the eventual superiority of numbers to finish the displacement of centuries of history and culture, unwelcome to the new citizenry. Soon running battles will be the norm and The Mad Max nightmare the final act in resolving the mess now engulfing us all. So The United Kingdom really is no more. The last vestiges of respect for others, selfless sacrifice and sheer "niceness" is lost forever. It's back to the law of the jungle and there is little room for soul in a war of attrition and despair. No longer can we offer sanctuary to the really needy, oppressed and persecuted. We are now becoming the self same victims of a global dictatorship where only economic warfare is to be pursued for the benefit of a lucky few. A few whose only qualification to join the upper echelons is the size of their bank balances. How those riches were gained is no longer relevant, is it? So there we have it. Elections that mean nothing and a lost Kingdom now divided and devoid of any semblance of the pride and freedoms once held so dear. Corruption, criminality and lies are the required assets for success. The future may be orange but it sure as hell isn't bright! More the vision of Satan's very own hell fire. If only we had more of the Boris ilk, with a character and a soul that resonates with all those, regardless of political persuasion, just because he is a more decent, human face than the hypocritical nastiness, tax avoiding, anti Semitic creep, so beloved of the Left and their warped sense of entitlement to morality. An attitude long since suspended and lost in the socialist mantra that the ends justify the means. No more is vote tampering and illegality a problem for the imported morality that now has joined with the endemic and once suppressed unpleasantness. Power and wealth rule, get used to it! My feelings too, but more eloquently written than I ever could. Bernie, I'm blushing, thank you most kindly. Though a downbeat post I still always retain a smidgeon of hope! What Bernie said .. eloquent indeed. This must be how the more enlightened souls in Rome must have felt in the days before Alaric the Visigoth indulged in a bit of unwelcome large scale immigration. The sun is definitely setting on the greatness that was England and we must do all we can to ensure that those facets of our national character, which have grounded us for all these years, continue with coming generations: helping one another, honesty and integrity when dealing with others no matter what we may receive in return, love and support for family friends and neighbours, respect for the wisdom of our elders and the innocence of youth, stiff upper lip, a gentle deprecation of any small talent we may have accrued, gentle humour and a general willingness just to rub along. And - above all, when all else may have gone by the board - the maintenance of Good Form. Our daughter, son-in-law and granddaughter visited this p.m. and we found ourselves, with much heaviness of heart - recommending again that they consider emigrating. Don't want to lose them but they should go where their lives will be be better. I'm damned if I see why they should sacrifice their coming years on the altar of the so-called Elite who have buggered this country beyond all recognition. It's quite remarkable how places like Australia, Canada and perhaps, most of all, New Zealand, have kept much of those traits we have watched our political EU arse lickers junk in favour of the most disgraceful gerrymandering selfishness and ethnic cleansing so beloved of their EU pals.